Its easy to make / cook or bake Malaysian sweet/ dessert or finger food but to explain? I could do all the talking in my head, but when the words come out of my mouth...it just doesn't sound right! Seems like my brain gets disconnected from my mouth as the words transcending. My good friend, Janet gave a kilo bag of desiccated coconut... yes a kilo!!! Oh and a kilo bag of raw peanuts too. What else can I do with so much coconut and peanuts? For the peanuts... I'll tell you my story some other time, just enough to say that my cooking experiment went awry :(. I made this sweet coconut crêpe, posted on my blog in late 2010. Add desiccated coconut and stir to mix well. Add cornflour mix with water to the sweet coconut. Put pandan leaves in food processors/ blender. Squeeze out juice as much as you can. Add plain flour to mixing bowl. Whisk in coconut milk into a smooth batter. Add green food colouring (optional). Ladle about 1/8 cup of batter onto the frying pan. Give a swirl so a thin pancake is formed. The crêpe is ready when the edges crisped and curled up. Follow the video link above or click the photo below ...to see the how to wrap and fold the sweet coconut crêpe. 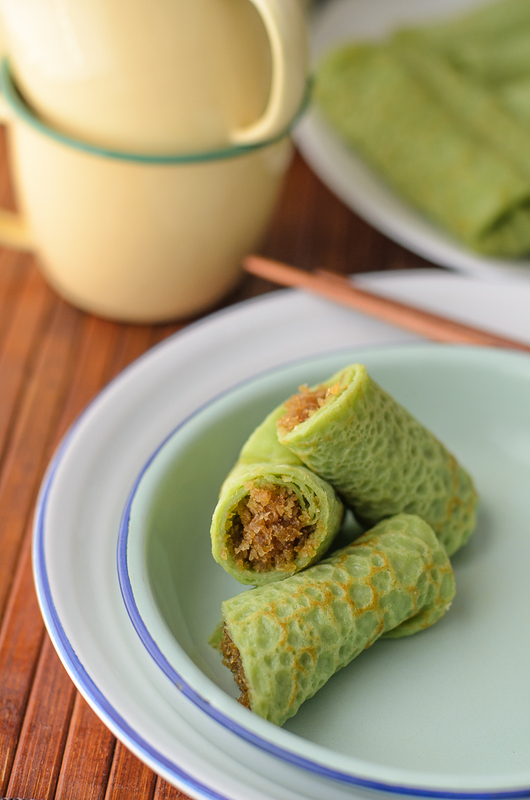 The pandan gives the crepes such a lovely green colour and that coconut filling looks to die for!